When I was in high school, Scott Hall showed up on Nitro and changed the face of professional wrestling forever. When he was later joined by Kevin Nash, and eventually “The Immortal” Hulk Hogan, they were renamed the NWO, and WCW’s ratings went through the roof. They were there to take over, and take the company in a new direction. I think we’re experiencing something like this with the Yankees right now. I’m going to be completely honest with you guys: Over the last few seasons, I have found myself watching the Yankees less and less. I followed every boxscore and still kept up with all the statistics because I love this team, but I found that, when my wife wanted to go shopping, or do something for the house or something else when the game was on… I didn’t try to get out of it so that I could stay and take in the game. It’s like I was looking for an excuse to not watch the team, and only really watched when I had nothing better to do. I still made it to games in person from time to time, but again, I wasn’t rushing to go to a couple of games a month like I once did. The Yankees were old, overpaid and underachieving, and they bored me to tears. Then, like with WCW in 1996, the NWO showed up to save the Yankees. It started with Gary Sanchez, who got here for good on August 3rd. He got to hitting, putting up a .357/.379/.571 with 3 doubles, a homer and 4 RBI in 7 games. I was already excited about the future of the Yankees before this year’s trade deadline. I got even more excited when Brian Cashman sold off the team’s assets at the deadline and brought back a plethora of young prospects. But, until Sanchez came up, I wasn’t all that excited about the current on-field product. Suddenly, with the addition of one new face, my interest was piqued. Say…hello…to the bad guy! After AROD Week, with one more aging veteran out of the way and the veteran stranglehold on the lineup weaker than ever, Sanchez’s buddies showed up to seal the deal. Suddenly, Tyler Austin and Aaron Judge were in the lineup too–the three youngsters hitting 6th, 7th and 8th in the lineup, respectively. This was a full on invasion! Much like Hall, Nash and Hogan, this trio had me watching a game on tv eagerly from start to finish, for the first time in a while. As I exclaimed to my buddy Tom while watching, I found myself not caring what the result of the game was. I was damn near giddy just watching the future arrive. Once the game started, the results were beyond my wildest expectations. In the bottom of the second, we got all three guys in a row against Rays pitcher, and fellow highly-touted rookie, Matt Andriese. Andriese had breezed through the first inning, looking good in the process. Then the NWO showed up. With one out, Sanchez came up and grounded out, but it turned out he was just setting the scene for his buddies to make the real headlines. Austin was down 0-2, but worked the count back to 2-2 and fouled off the fifth pitch. On the sixth pitch, he got a 92 mph fastball on the outside of the plate and just met it with his bat. As the fly ball sailed towards the outfield, right fielder Mikie Mahtook kept going back further and further towards the fence. Eventually, he ran out of room and the ball landed in the seats, just barely managing to scrape over the 314 sign. For the second time this week, an NWO member had hit his first major league home run (Sanchez had bashed his against the Sox at Fenway on Wednesday). More importantly, and improbably, Austin had hit his in his first major league at bat, something that only 115 other players had ever done, and only three other Yankees (John Miller in 1966, Marcus Thames in 2002 and Andy Phillips in 2004). Up next was Judge, now with a lot to live up to thanks to his buddy Tyler. Like Austin, Judge quickly found himself down 0-2. He took the third pitch, a change up, for a ball. Andriese, figuring Judge would be looking for a fastball and not expecting another offs-peed pitch, went back to the well with an 87 mph change up down the pipe. What Judge did to that pitch should be outlawed. As the crowd gasped and started getting excited about the trajectory of the ball, center fielder Kevin Kiermaier turned and sprinted toward the fence. He soon gave up, and watched the ball hit above the Mohegan Sun Sports Bar glass–a 446-foot mammoth shot. I can’t tell you how many all-caps IMs and text messages I sent when I saw Judge’s ball land. Judge was now the 117th major leaguer to ever homer in his first at bat! Are you kidding me? Could there have been a better start to the New Era of the Yankees? Austin and Judge became the first teammates to ever hit home runs in their first major league at bats in the same game, let alone back to back. Ever! It was an awesome moment that the two friends, and fans like me, will never forget. As for the rest of the game, the other young Yankees also contributed. Didi Gregorius (26), Starlin Castro (26) and Aaron Hicks (26) all homered, marking the first time in team history that five players 26 years old and under had homered in the same game. The Yankees romped the Rays 8-4, and 27-year old ace Masahiro Tanaka got the win. 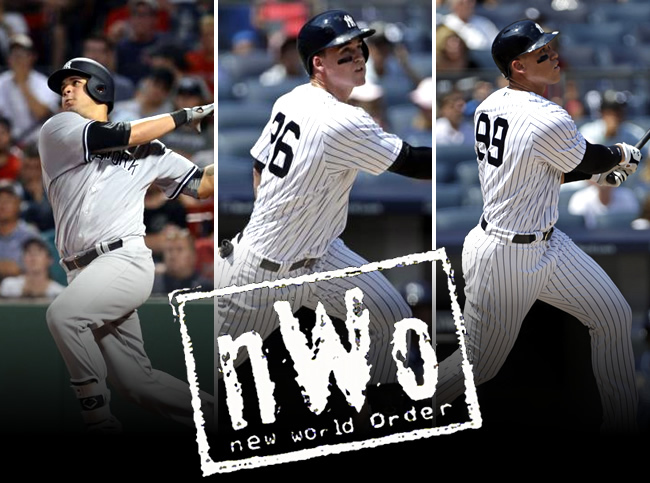 Thanks to the NWO, for the first time in a while, the future is looking very bright for the pinstripes…. and there are more coming.